Stop the presses. She's blogging...again. In the same vein of my last post, (though this time I don't think I will get up on any "Stop being a belligerent racist" soap boxes) I'm throwing an update at you all about a post I wrote about a year ago. So, where I left off was keeping The Incredible Hulk rear-facing until further notice. And I know you've all been waiting with bated breath to find out how it all turned out. Anyway, this is where is how it all shook out. As you probably remember, I was really disappointed when our pediatrician officially revised his recommendation to match that of the American Academy of Pediatrics. Looking back, I don't know why it was such a big deal to me. I think mostly, it came from the fact that TIH had started to scream his little TIH head off every time we were in the car. And who could blame him. It was the middle of a hot St. Louis summer and he was facing away from the only source of air in our car. Plus, he had reached the weight required for forward facing when he was 6 months old. His height was becoming an increasing problem as he was now able to easily kick the seat in front of him. I think it also came from the idea that when I was a kid, we were basically held in a car by a Bandaid and a prayer. I can actually remember a period of my life where I was almost ALWAYS rear-facing. In the back seat of my parents' station wagon. When I wasn't even wearing a seatbelt. Or sitting in a seat for that matter. Fortunately, times have changed. And, thank God for that. I'd like to just brush off these sorts of ideas by saying, "Eh, I survived it when I was a kid." But then again, our parents survived their moms smoking and drinking throughout their pregnancies. So, with the same attitude, I embraced our pediatrician's recommendation and kept TIH rear-facing far past his first birthday. 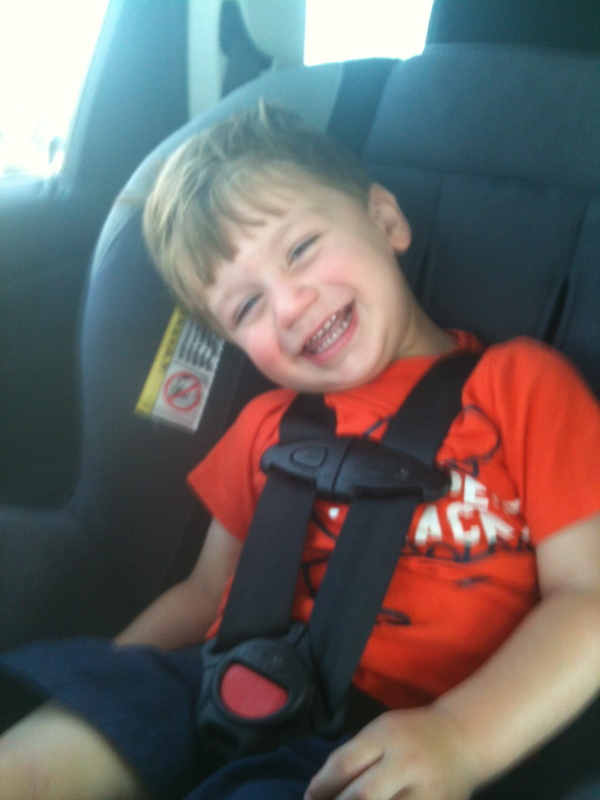 I kept him rear-facing even after we got a minivan with a backseat entertainment system. And he learned to watch Jake and the Neverland Pirates on DVD through his car seat mirror. In fact, it was on our way back from one such trip, the one in which we had officially closed on our home in Chicago, that we had our first problem. A problem that had TIH screaming his head off for a completely unknown reason (but suffice it to say, he had HAD it with the car seat) and almost resulted in me slamming into a median on the interstate while trying to reach around to comfort him. It was then that I started to really question if rear-facing was still our safest option. Sure, it kept his head, neck, and major organs protected the best. But, he was clearly uncomfortable. And a screaming toddler is distracting. And distractions are the worst thing for a driver to encounter. We waited about a month longer and asked our pediatrician. He still held strong to his recommendation, but said, "You're about 2 months out. The recommendation is still technically 2 years, but I understand. If he's screaming, that isn't good either." So, on our next big trip up to Chicago, we turned him around. I'm happy with our decision. I'm happy we did it for as long as we did. With another kid we might keep them rear-facing for even longer. And who knows? By then, the laws may catch up with the recommendations and we won't really have a choice. But, more importantly - and this is true for anything you do as a parent - I've learned you've got to follow your instincts. We may do things differently now. And there's a reason for that. But, there's a reason we all survived the backseat of the station wagon too. And, if you ask me, parental instincts had a whole lot to do with that. We turned ours around early and it was all good. it is a "recommendation" after all. I often wonder about that. Glad to hear that you did things your way.